When most people think of retinol, they think of its anti-aging properties, how it stimulates collagen production, and how it decreases the appearance of fine lines and wrinkles. What most people don't think of, however, is its acne-fighting capabilities. I, for one, swear by applying a single drop of my Perricone MD OVM Instant Tightening Serum With Retinol ($155) to an emerging blemish after I wash my face. Come morning, the spot will have shrunk visibly. According to Lamees Hamdan, founder and CEO of Shiffa, retinol works wonders for improving the state of acneic skin, thanks to its chemical composition. It is, after all, a derivative of vitamin A. "Vitamin A derivatives help speed cell turnover to stop dead cells from clogging pores and causing some forms of acne," she explains. "Since they exfoliate the upper layers of the skin, they also allow anti-acne creams and gels to penetrate better, enhancing their results (even if you prefer going the more natural anti-acne route and like using tea tree essential oil)." In short, retinol could be the one acne-banishing ingredient that your skincare routine is missing. You just have to know how best to use it, which is where skincare experts like Hamdan come in. First things first. There are two different classes of this vitamin A derivative. They are retinol and retinoids. The latter, according to Hamdan, is a "new generation" of vitamin A derivative that works more effectively than retinol. "These new-generation retinoids are in the active state and absorbed by the skin, while retinols need to first be converted to a more metabolically active form, so they tend to be less potent and take longer to work." However, if you have sensitive skin that's prone to irritation, it might be better to stick to retinol. "Retinols are usually much gentler on the skin, but I can't advise frequency because it depends on what you're using and what is with the retinol (some manufacturers like to mix it with a fruit acid, which I don't recommend, as I believe it's much too harsh on the skin)," she explains. "But usually you want to aim to use it every day on cleansed, dry skin at night." Whichever you choose, a retinoid or a retinol, know that it will still have a positive effect on your complexion. "Retinol is one of the most effective treatments because it addresses all acne: blackheads, whiteheads, cysts, pimples—all. It clears existing acne and prevents clogging and new acne," explains Francesca Fusco, MD, of Wexler Dermatology. She recommends starting with an over-the-counter formula, like Differin Acne Treatment Gel ($12), which, in my humble opinion, is the skincare equivalent of bottled magic. Apply it to a blemish after you cleanse, and it diminishes the size and redness of it by morning. Seriously, it's been a mainstay in my medicine cabinet ever since I first tried it. 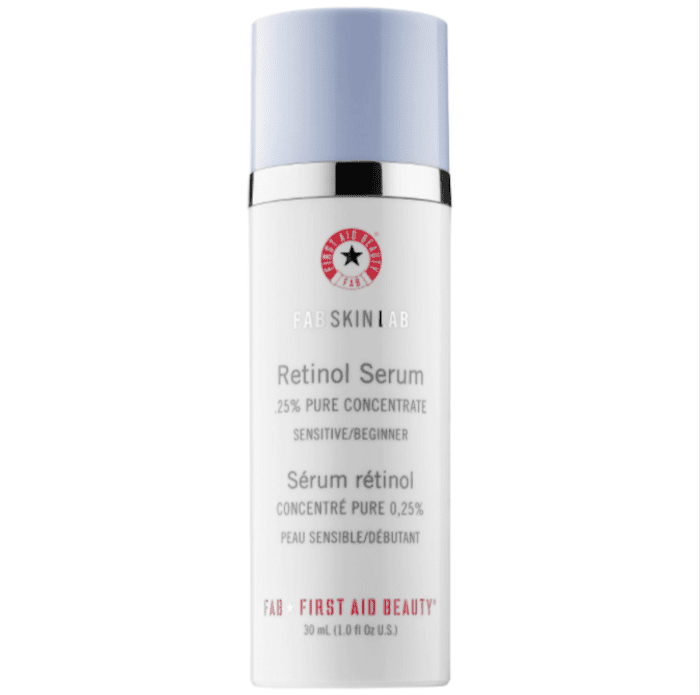 Fusco also likes First Aid Beauty's FAB Skin Lab Retinol Serum 0.25% Concentrate ($58). "It's gentle yet effective, and in many cases is enough. For sensitive skin, consider starting with every other day." As for Hamdan, she recommends using Shiffa's latest product, which is an acne-fighting retinoid that also offers myriad other skin benefits. "Shiffa Rose Maroc Night Elixir ($175) contains 4% granactive retinoid, as granactive retinoids are one of the most bioavailable nonprescription forms of vitamin A derivatives in the market. It also helps lighten skin pigmentation (as a result of the acne) and helps decrease the appearance of pores." The retinoid is mixed with rose, which boosts circulation and speeds up skin healing, among other things. What's really significant, though, is the packaging. To avoid oxidation (and thus loss of efficacy) of the vitamin A, the waterless formula is packaged in an airless bottle. Celebrity esthetician Shani Darden beautifies the skin of A-listers like Jessica Alba, Rosie Huntington-Whiteley, and Chrissy Teigen. She also lauds the acne-fighting powers of retinol. "It's always best when starting a new retinol product to begin with one night a week and build up slowly, adding just one additional night a week to give your skin time to acclimate," she says. "You can build up to as many nights as your skin can tolerate." The only people who should avoid using retinol are those who are pregnant, breastfeeding, or love soaking up the sun. "If you're a person who likes being in the sun, retinol is not for you," Darden warns, as it's an ingredient that can make your skin more sensitive to damaging UV rays. "Also, it's important to make sure you're using the right moisturizer for your skin type to help offset the dryness that some retinols may cause." She (along with many of her aforementioned celeb clients) swears by her namesake formula: Shani Darden's Texture Reform Serum. The retinol that's found inside works its magic on fine lines, wrinkles, and acne, while lactic acid exfoliates and aloe soothes. "A lot of prescription retinols can cause peeling and redness, which can turn a lot of people away from it. My Texture Reform is a gentler retinol serum that works hard but won't dry your skin out the way some prescription retinol will." As always, apply it to cleansed skin at night before you go to bed, just as you would a traditional facial serum. Come morning, you might just notice a visible improvement in the state of your acne. Just be sure to protect your newfound clear skin with sunscreen and an adequate moisturizer. I'm not trying to be a broken record, but skincare is all about health and prevention, so do as the experts say. I've Tried 'Em All: Why Doesn't Retinol Work for Me?